Here be dragons--and elves, wizards, and unicorns and all the wonders of fantasy! Here they are, collected in one indispensable volume--the most acclaimed stories of our time by the world-famous authors who have made fantasy the most exciting and popular genre in all literature. Known for their bestselling Dragonlance Chronicles and Legends, noted authors Margaret Weis and Tracy Hickman have brought together their own personal favorites--the immortal treasures of fantasy that inspired them--into an authoritative collection of imaginative excellence that is an essential addition to every bookshelf. 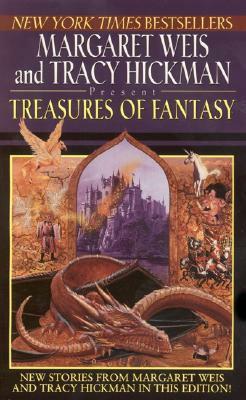 Treasures of Fantasy also includes a new story by Margaret Weis and Tracy Hickman, original to this edition. If you truly love great fantasy, here's the one book you must have.